A favourite childhood ice cream of mine was Neapolitan. When given the difficult decision of what flavour ice cream to pick as a kid in the supermarket the solution of having strawberry, vanilla and chocolate all in the same tub sounded like magic, so I’d often pick the Neapolitan. I will always have an association of summer for these flavours, and as the weather is starting to pick up its seems nice to resurrect them again, but this time in the form of popcorn. 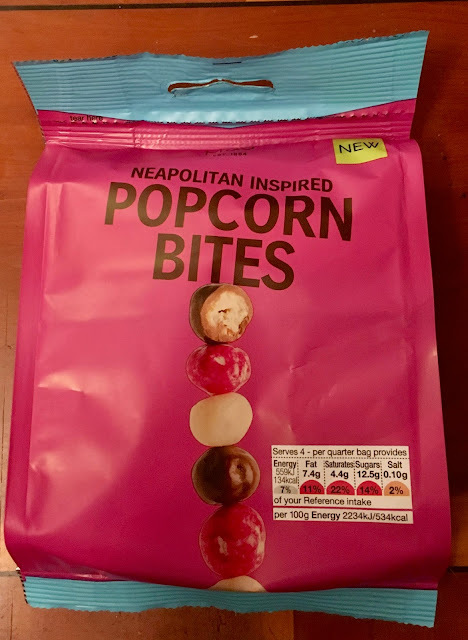 Mark and Spencer have brought out this new Neapolitan Inspired Popcorn Bites, where we have pieces of popcorn coated in milk chocolate, white chocolate and a strawberry coating. I poured some out to take a closer look. The pieces of popcorn do look very smart, particularly the pink ones, and I gave them the taste test. Each piece of popcorn had a nice thick coating of chocolate. The milk chocolate worked well, and had a good cocoa flavour. The white was sweet and creamy. The pink ones were mainly white chocolate in flavour, with just a hint of fruitiness. I think this is where they could have added a bit of strength to the fruit, but they were still very tasty. I liked the mix of texture from the different shapes of pop corn, and the coating giving them a nice substantial feeling. I think I might be adding a tub of Neapolitan ice cream to my next online order too, just for the sake of reminiscing.